- Or worse: stolen passwords, credit card numbers, emails, private documents, etc. Yes it is true. The spyware is installed in your computer because YOU installed it. You know they are applications, they are computer programs, they may harm your computer. And how about these? Would you try to open them? Just double-click. Are you not curious? It costs nothing to try! You know they are a ZIP file, a folder, and a text file. But... have you ever thought... that the above files might be some viruses in disguise? It is possible to disguise a computer program as a "folder" simply by changing the program's icon. A programmer can use any icon for his program. This means he can choose a Windows folder icon (or text file icon, ZIP file icon, etc.) for his program. Once executed, this seemingly harmless program can do anything: it can record your keystrokes, log your activities, display random pop-up windows, slow down your computer, and so on. Most likely you will notice the .exe file extension. You know .exe is the file extension for applications. Unknown applications are dangerous; you won't open them. What is a "file extension"? It is the one or several characters at the end of a filename. For example, if you have a file MY LETTER.TXT, the file extension is TXT, and it indicates the file can be opened with Notepad. Of course you have heard of MP3, JPG, ZIP, MPEG, EXE, ... They are all file extensions. Common file extensions for applications are EXE, COM, and BAT. You should not open files with suspicious extensions. File extensions are hidden by default, so you have to unhide the file extensions. 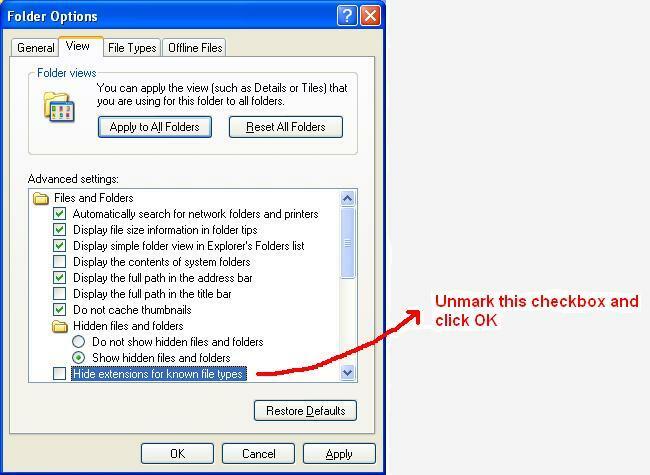 In the Folder Options windows, click the "View" tab and unmark the option "Hide extensions for known file types". Click OK.
Now you can see the file extensions and won't be vulnerable to the cheap trick explained above.